Lowdown: The personal story of three people in a world where water all of a sudden turned scarce. Paolo Bacigalupi has made a name for himself with his lineup of post apocalyptic / dystopian books. The Windup Girl, his Hugo winning book, had established his propriety post global warming universe. He revisited this universe in the YA titles Ship Breaker and The Drowned Cities. Following that, he turned his attention towards more immediate threats, such as the way we process our food (Zombie Baseball Beatdown) and the way our politics is governed by spin in The Doubt Factory. With The Water Knife, his latest, Bacigalupi goes back to his roots. Not the full on post global warming world of Windups, but a world no better; a world not unlike ours but where water has, all of a sudden, become scarce enough to become the most precious commodity. And, as is also notable, he goes back to writing for adults after a series of four YA titles. You can see where Bacigalupi gets his water scarcity idea from. We are already heading towards droughts being the business as usual state of affairs in places such as California as well as extended areas of Australia. With many of our cities built as havens in the middle of deserts, and with the American history of water rights going to whoever made a historical claim first, it is not hard to see how just a small tip of the global warming balance sheets would drive millions of people into cataclysm. The Water Knife does not focus on millions. Instead, it chooses to tell the millions’ story through the events transpiring on three people. First there is the Water Knife himself, a hired mercenary in the services of Las Vegas, whose job it is to stop at nothing to secure Vegas’ water supply. That includes stripping other cities, with their tens of thousands of residents, of their water. Countering him is an ideological journalist from the east coast, where it still rains, who came to tell a story and finds herself unable to leave. And the third is a young Hispano woman from Texas, turned water refugee, who is now trying to come of age and live a life in a non hospitable world. 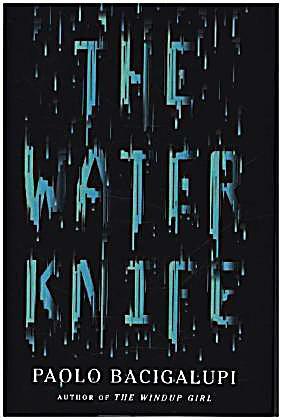 There is much savagery and violence in The Water Knife’s world. Typically for Bacigalupi, there are longish descriptions that I often found frustrating; clearly, this author feels the need to say what can be said in two sentences over two pages. I will concede, though, that it is this style that helps a reader create a detailed etching of a world that could well be (and rather soon), in one’s head. Once the stories of the three protagonists converge, affairs become more flowing and an exciting tale unfolds. Bacigalupi is a visionary, no doubt about it, and his warnings should not fall on deaf ears. However, his style does tend to be rather laborious, which definitely detracts from the sheer pleasure of reading and is particularly noticeable when the subject matter is far from pleasurable. 3 out of 5 thirsty crabs.